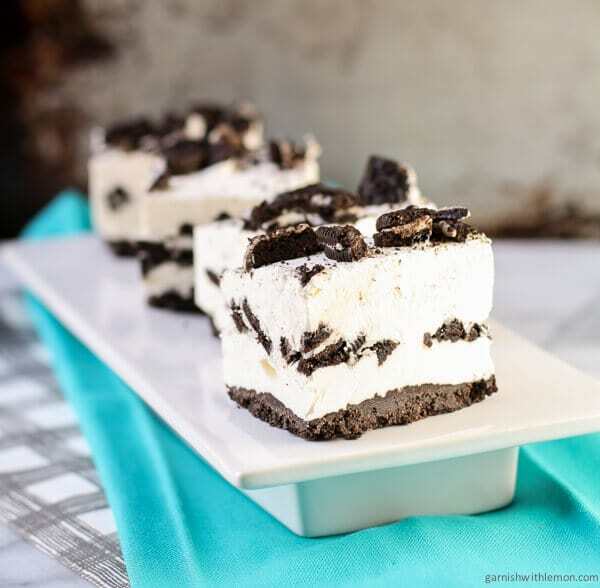 Keep the heat out of the kitchen with these No Bake Cookies and Cream Cheesecake Bars! Sometimes the best desserts are the easiest ones. You know the ones I’m talking about, right? Short ingredient lists and one-bowl wonders that don’t even need to go in the oven but still look and taste like they are complex and time consuming to put together? That, my friends, is my summer love language when it comes to desserts. 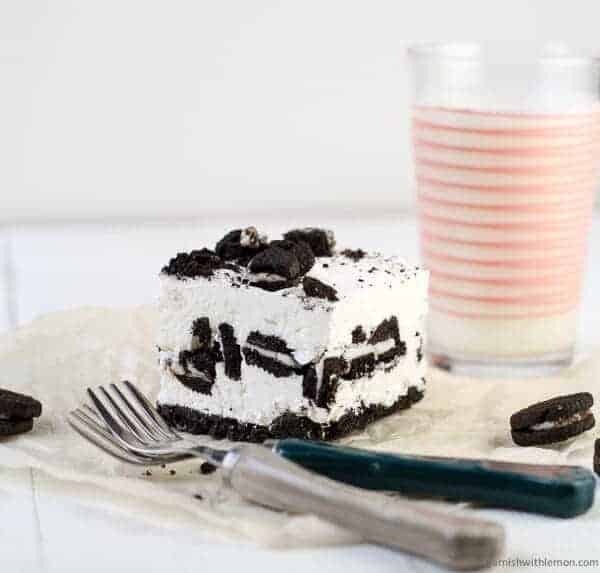 These No Bake Cookies and Cream Cheesecake Bars hit all of these important criteria. It’s got the chocolate cookie crust that my friends and family go crazy for, is topped with layers of whipped cheesecake and has chocolate cookies wedged in between it all. These cheesecake bars are light and airy but full of flavor; kinda like a summer version of the dense baked cheesecakes we love. Best of all? They aren’t too sweet thanks to a generous scoop of tangy sour cream. The contrasting layers of cheesecake and chocolate cookie make them pretty enough to serve to company but easy enough to whip up on a Wednesday when the sweet tooth craving hits. Each bite is full of smooth cheesecake flavor with a cookie crunch, all without having to turn the oven on. I’ll happily crank up my oven to bake a cheesecake in winter, but summer is for easy, oven-free cooking whenever possible. Line the bottom of an 8 x 8 pan with aluminum foil. In a small bowl combine cookie sandwich crumbs with melted butter until all of the butter is absorbed. Press the chocolate cookie crumb mixture into the bottom of the pan and press with fingers until mixture is compacted. Freeze for 15 minutes. In a medium bowl, place cream cheese and sugar and mix until light and fluffy. Add sour cream and mix until combined. Fold in thawed Cool Whip or homemade whipped topping and stir until combined. Pour half of the cream cheese filling on top of the crust. Scatter 1 cup of the chopped cookies over the batter and gently add the rest of the cream cheese filling over top. Scatter the remaining chopped chocolate cookies on top. Refrigerate for at least 5 hours or until set. I freeze mine to get them even to set up even more. If you want a creamier bar, refrigerate. I so wish I could have participated today! These look bomb! And, no bake too boot! Pinned! NO bake desserts are the best! Thanks for the pin! Happy Cheesecake Day!! Your bars look incredible!!! I just found your blog through Twitter and I went straight here and drooled! Great recipe. What a beautiful no bake cheesecake! Love that cookie layer! One-bowl wonders! I love it! I also love this no bake cheesecake! My kids would go crazy for this cheesecake. Mine did too! Thanks, Barbara. I am lovin’ this DAY—Cheesecake Day. Another reason why life is good. And so is this recipe. Yum. I pinned it. Completely agree, Carol! Thanks for the pin! I am seriously powerless when it comes to anything cookies and cream flavored, especially cheesecake. This is what I requested on my birthday a year or so ago and it is just the most delicious thing. I love your easy no-bake recipe! No bakes are the best!! I love cookies and cream..so these bars will not last at all!! I love desserts where the oven isn’t involved-perfect for summer! Lately easy is the word in my house. I am so in love with this! Pinned! Right there with you! Thanks for the pin, Dorothy! Couldn’t agree with you more, Becca! i am SO craving one of these cheesecake bars right now.. love that they are no bake, definitely perfect for summer! Thanks for your sweet comment, Denise! Come over and I’ll give you one 😉 Thanks for the pin. These look fantastic! Gotta love no-bake desserts on hot days. Especially no bake desserts with Oreos. My Oreo cheesecake never looked so good! I need to get some tips from you or maybe try your recipe. When I tried to cut mine, all the cookies crushed into the cheesecake layer turning it into a complete disaster. Thanks for sharing and for joining us to celebrate this delicious day! Thanks for organizing such a fun day! Thanks! That ended up being great and thus easy to make. ok, 3 big wins in my book: cheesecake, cookies and cream and it’s no bake!!! love this!! Love no bake desserts for the summer and this looks fabulous!! OMG! I need to make these!! They look so amazing and sound so easy to make. They are super easy and so delicious! Thanks, Karyn! Oh my goodness, we just love cookies n cream around here (how could you not?! ), so I can see this happening in the near future for sure! Thanks, Holly! Your family will love them! What a dreamy dessert! My husband needs this for his birthday for sure! Love how simple this recipe is! It’s such a great idea to make desserts like this one for summer parties so you don’t have to think about it when guests are around! Love the addition of Creme fraiche. So happy your family loved it!